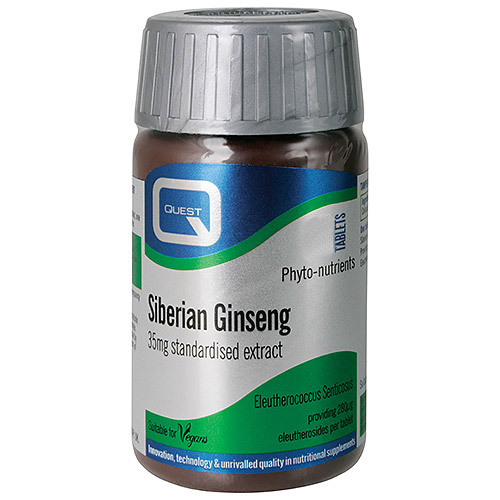 Quest Siberian Ginseng may increase the ability to withstand adverse conditions and enhance mental alertness and productivity. Standardised to ensure a consistent level of the active component in each tablet. 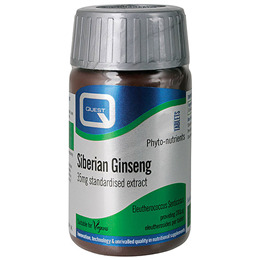 Why use Quest Siberian Ginseng? Di–Calcium Phosphate, Bulking agent: Microcrystalline Cellulose, Siberian Ginseng extract, Magnesium Stearate. Not recommended for use during pregnancy and breastfeeding. Not recommended for use when taking anticoagulants or steroid medication and individuals with hypertension or psychiatric disorders. Below are reviews of Siberian Ginseng - Concentration Aid - 90 x 35mg Tablets by bodykind customers. If you have tried this product we'd love to hear what you think so please leave a review.